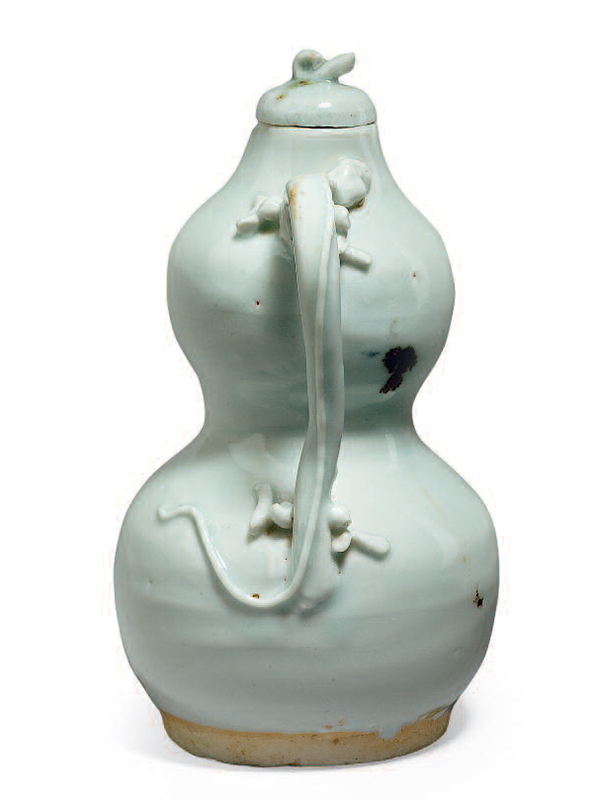 A qingbai porcelain ewer of double­gourd form, supported on a short, straight foot and applied with a long, curved spout and an S­-shaped handle in the form of a chi-­dragon. The chi-­dragon is naturally rendered and well­-defined with bulging eyes, four feet and elongated tail. The short neck of the ewer is surmounted by a domed cover, which has a finial in the shape of a section of a stem. 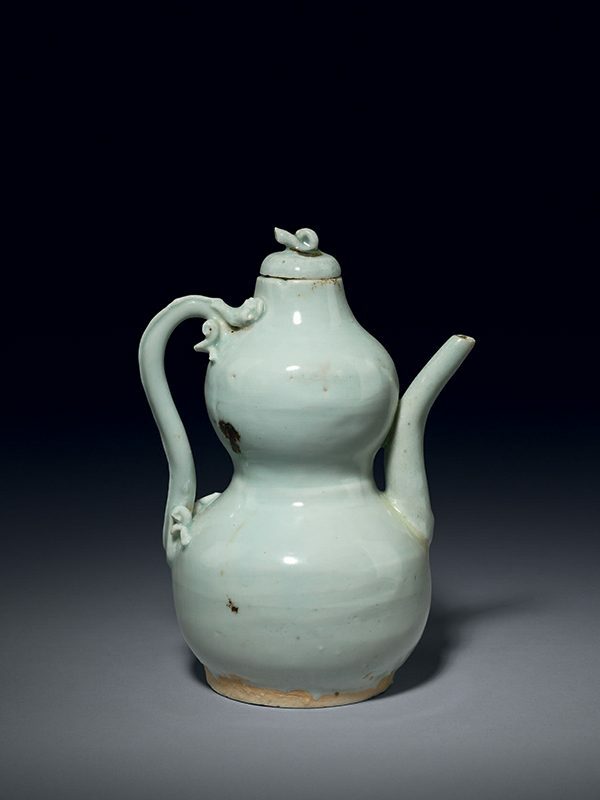 The ewer is covered in a transparent glaze of pale blue colour, leaving only the base unglazed, and a few iron brown spots of irregular form are visible on the lid and around the body. The unglazed base shows the fine porcelain body. Undecorated qingbai ewers of double­-gourd form were produced during the Song dynasty (960 ­- 1279), such as an example dated to the 11th or 12th century in the Meiyintang Collection, and another one excavated from Le’an county and dated to 1204. Later during the Yuan dynasty these double­-gourd shaped qingbai ewers were still as popular as their Song dynasty predecessors, and can in general now be distinguished by irregular brown iron­oxide patches applied to the glaze, as can be seen in the present ewer, a rare survivor. In this form, the ewer is the precursor to later ewers of this shape that date from the Ming dynasty (1368 – 1644). Two closely comparable Yuan dynasty qingbai ewers, similar in the double­-gourd shaped body with iron-­brown spots and the dragon handle, are respectively in the collection of the Metropolitan Museum of Art  and the Victoria and Albert Museum. A Yuan dynasty double-­gourd shaped qingbai ewer with a dragon handle was excavated from the Shangqing temple in the Chongqing City in 1954 and is now in the collection of the Chongqing City Museum.